A few years ago, many of us hadn’t even heard of coconut oil, but now it appears everywhere we go. In recipes, health magazines, and listed as ingredients in products. Many suggestions have been made as to potential health benefits of coconut oil, but what evidence is there to support this? We posed our questions to our very own nutritionist Rebecca Haresign to find out more about coconut oil, and whether we should be including more of it in our diets. As the name suggests, coconut oil is a fat derived from coconuts. Fat is made up of fatty acids, and the structure, length and saturation of these fatty acids determines their health effects (1). Most foods contain a mixture of both saturated and unsaturated fatty acids, and so we tend to refer to foods as being high in saturated or unsaturated fats depending on the type of fat they’re predominantly made up of. Coconut oil is predominantly made up of saturated fatty acids (85.5%) (2). To put this into context with other types of fats, coconut oil contains more saturated fatty acids than lard (40% saturated fatty acids), beef dripping (51%) and butter (52%) (2). I’ve heard coconut oil can help me to lose weight – is this true? Fats and oils, like coconut oil, provide 9 calories per gram. This is more calories than the other macronutrients provide, as carbohydrate and protein each provide 4 calories per gram. As weight loss is a result of consuming more calories than your body requires, including large amounts of ingredients rich in fat can increase your calorie intake and could lead to weight gain rather than weight loss. Many of the benefits of coconut oil have been attributed to the type of saturated fatty acids present in coconut oil. Coconut oil is rich in medium-chain length fatty acids (MCFA), and some research has suggested that this type of fatty acid can help people to lose weight when replacing long-chain fatty acids (LCFA) as they’re more easily absorbed and metabolised by the liver (3). 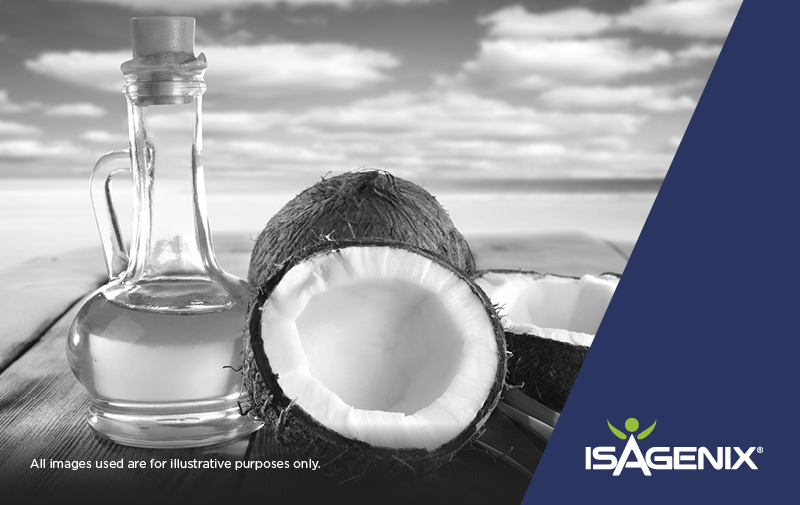 However, as coconut oil is made up of a combination of MCFA and LCFA it may not have the full effect of these benefits. Research on the benefit of coconut oil to health is from a small number of studies (4, 5) and further large, well-controlled human studies published in peer-reviewed journals are needed to demonstrate any direct health benefits of con coconut oil. There is greater evidence to support other methods of weight loss, such as reducing calorie intake and intermittent fasting – both of which you can easily achieve with Isagenix Shake Days and Cleanse Days*! Which type of fat should I be using in cooking? The evidence supporting the link between high intakes of saturated fats with increased risk of heart disease is well established, and has resulted in global recommendations from the World Health Organization (WHO) are to reduce intakes of saturated fats to no more than 10% of total energy intake (6). Research has shown health benefits when saturated fats are replaced with poly- and mono-unsaturated fats. In practical terms, this means limiting the use of coconut oil, butter, and other fats which contain predominantly saturated fatty acids and replacing with fats rich in unsaturated fatty acids. Oils that are lower in saturated fatty acids include olive, sunflower and rapeseed oils which provide 14, 12 and 7% saturated fatty acids respectively (2). Olive oil is rich in mono-unsaturated fatty acids and, in addition to a wealth of research supporting the health benefits, there is a European Food Safety Authority (EFSA)-approved health claim (7). * A Cleanse Day is a nutritionally supported fast that nourishes and energizes your body’s own detoxification systems. For further Cleanse Day information, visit Isagenix.com. Agostoni C, Bresson J, Fairweather-Tait S, Flynn A, Golly I, Korhonen H, Lagiou P, Lovik M, Marchelli R, Martin A et al. Scientiﬁc Opinion on the substantiation of health claims related to polyphenols in olive and protection of LDL particles from oxidative damage (ID 1333, 1638, 1639, 1696, 2865), maintenance of normal blood HDL-cholesterol concentrations (ID 1639),maintenance of normal blood pressure (ID 3781), anti-inﬂammatory properties (ID 1882), contributes to the upper respiratory tract health (ID 3468), can help to maintain a normal function of gastrointestinal tract (3779), and contributes to body defences against external agents (ID 3467) pursuant to Article 13 (1) of Regulation (EC) No 1924/2006. EFSA Journal 2011;9: 2033.2031–2025.